On my hook a jar full of holly berries. On my kindle Our Souls at Night by Kent Haruf. I have put my socks to one side for a bit while I work on some wreath bits in the hope of being set up on Etsy to hopefully sell a few things in the run up to Christmas. Eeeeeek! Its very exciting new ground for me and I have a plan so watch this space to see how things work out! I love Our Souls at Night! Last night I stayed up later than I should to finish a very disappointing book. Not Good Omens, I thoroughly enjoyed that book and finished it a few days ago, but a novel I had chosen as something quick and easy with apparently a shocking twist which I had spotted before the end of the first chapter. I really dislike it when a book lets you down. Especially as this one is well reviewed on GoodReads and should have been better. So this morning I perused my Amazon wishlist of books waiting to be read, dithered between a few and chose this one. I’m so glad I did. I sat down with it and my breakfast and struggled to tear myself away. I can’t wait to get back to it later. It has a simple premise but I’m gripped. Linking up with Ginny and the other Yarnalongers sharing what they are working on and reading. Over the last couple of weeks I have been super busy moving house and have had no time to blog. Or craft. Or read! But we now have all of our things in our new home and a lot of them sorted from boxes and bags into cupboards and onto shelves and we are starting to feel some normalcy return. And what could be more normal than joining the Yarn Along on a Wednesday?! So photograph taken on my phone, post written on my phone. On my needles dragonfly socks. 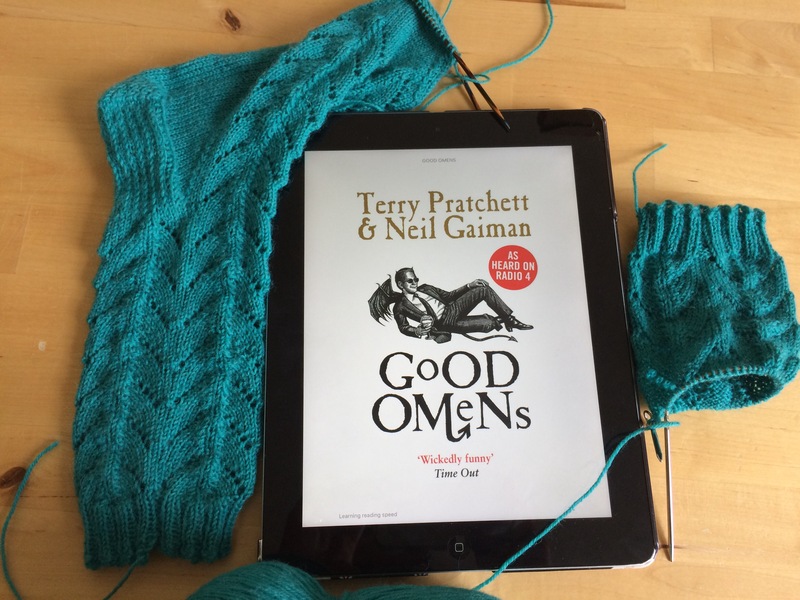 On my kindle Good Omens by Neil Gaiman and Terry Pratchett. I have been managing to squeeze a little knitting into the evenings in the last week when I have run out of unpacking energy and so I now have one of these socks just in need of the toe grafting and the other one well on its way. I’m really enjoying the book as well in the odd snatcher moment I can find to read although I am finding it very Pratchett and not picking up much of Gaiman’s influence. I’m hoping in the next day or two to be in a position to write a post about my new craft room, I have missed posting here and have had many opportunities for crafty daydreaming while busy cleaning so I’m expecting a big burst of creativity once I have a bit more time! Linking up with Ginny and others sharing what they are crafting and reading. 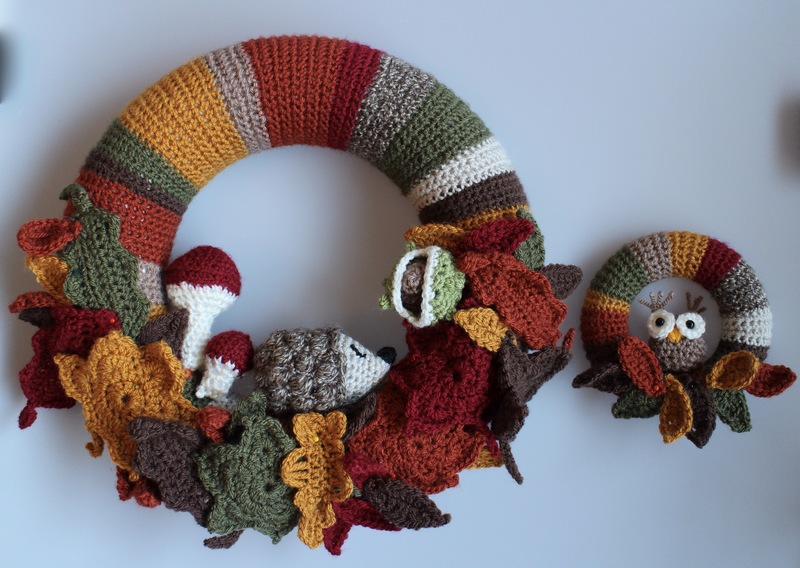 Remember my Autumn Wreath? I made a mini one! 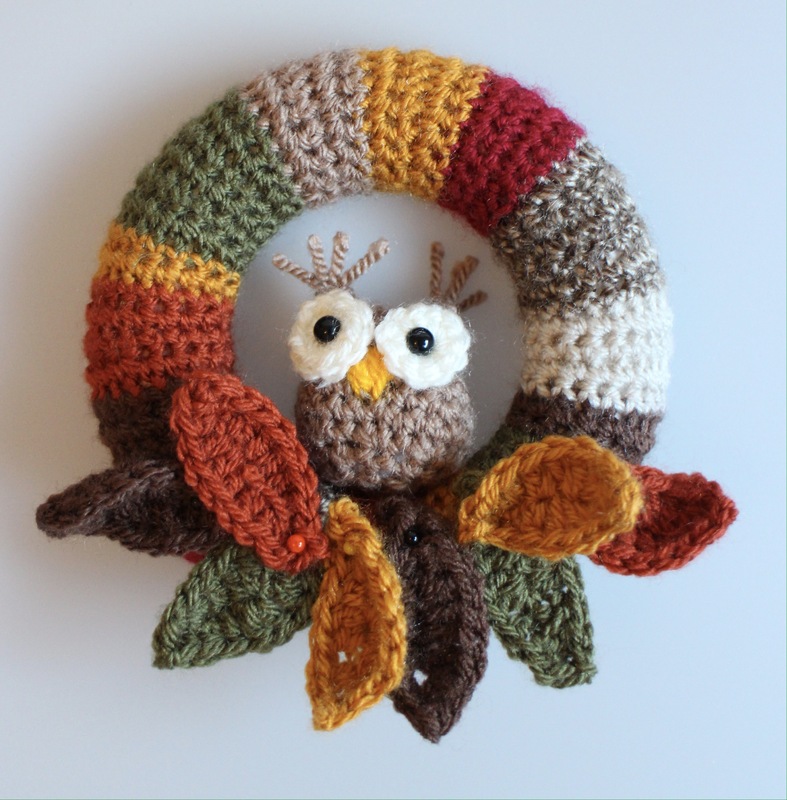 The owl pattern is my own and I plan to write it up and put it here soon. 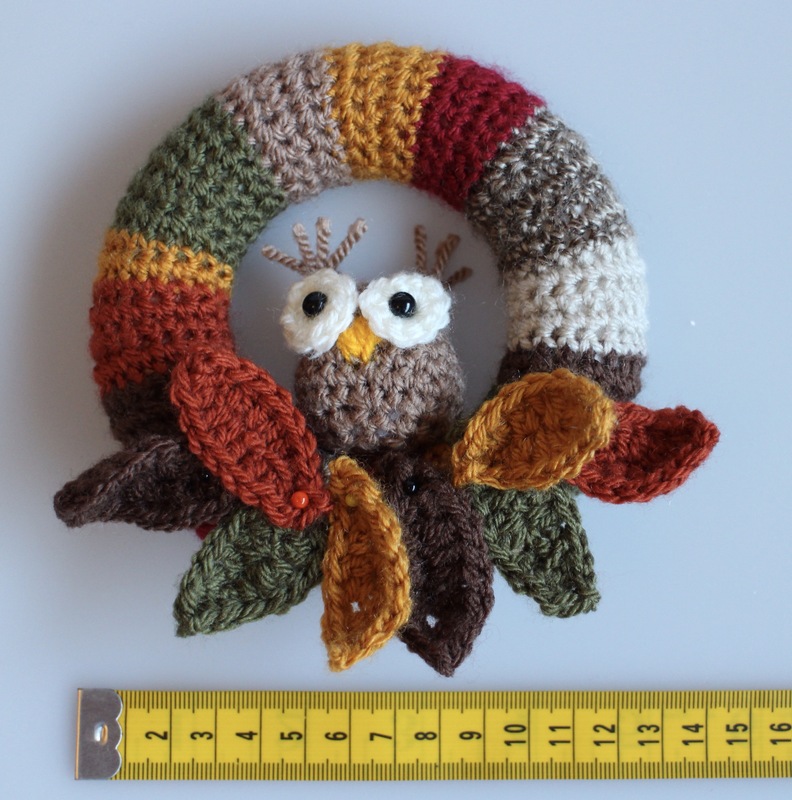 I also have lots more to say about mini wreaths but as we move house in 5 days time I really should be packing and organising rather than crafting and blogging! So I’ll be back soon with details but for now here’s some photos!